Different approaches to argument work better or worse for different people. Some people need coddling, while someone else’s frontal cortex requires defibrillator shocks to jolt it into a logical rhythm. A few studies I’m aware of suggest that most people become harder to persuade if you insult them directly, however I’m unaware of the effect on an audience not directly subjected to the insult. Anecdotally, it seems plausible that making certain positions embarrassing can marginalize the belief. Regardless which approach works best, I’d like to dispel a misunderstanding about ad hominem fallacies. Whenever faced with harsh criticism or mockery, many people seek to neutralize their opponent by entangling them in the fallacy. 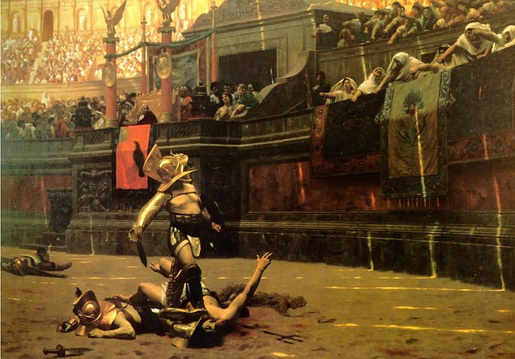 These modern retiarius gladiators often miss; the rete netting just isn’t as wide as they believe. An argument isn’t logically invalid because it is harsh or because it utilizes mockery – it only breaks down if the argument irrelevantly links a personal attack to the validity of the argument itself. For example, I read Jonathan Chait’s blog and often enjoy his rhetorical stabs. In a recent post, he attacks “Paul Ryan’s Innumeracy” – the title itself insults Ryan’s personal abilities, but Chait seeks to demonstrate the erroneousness of Ryan’s numbers to illustrate Ryan’s “innumeracy.” In contrast, if he argued that Ryan is innumerate, therefore the numbers are wrong we’d have a fallacy. I’ve accused Paul Ryan’s opponents of using ad hominem against him before and where they tried to demonstrate why they see him as a “charlatan” I may have overshot even if I’m not convinced he’s deliberately deceitful. Not every occasion calls for it, but I’m comfortable ridiculing religious and monetary cranks when their positions warrant it. Their arguments aren’t wrong because they are cranks; they’ve demonstrated their crankery through their beliefs. Labeling David Barton a “pseudo-historian” isn’t a flaw in my argument, it’s a well-earned moniker. If Ta-Nehisi Coates points that out the Tea Party or Donald Trump engaged in racism, he isn’t being fallacious, he’s providing an accurate description of their actions. When I criticize a specific idea, I usually do so not by examining it in the abstract, but by focusing on a particular person’s expression of that idea. That’s how one avoids fighting strawmen and ensuring accountability (I strongly prefer “X wrote” instead of “some say”). But the focus for me is always on the idea, not its personal advocate. The point of this post was not that Kevin Drum is a mindless, subservient follower of the President’s (the fact that I said I read him regularly and find it worthwhile should make clear that I don’t think that). The point was that Kevin Drum expressed an idea that I found worthy of criticism, both because it was wrong and consequential (consequential because I encounter it frequently enough to make it worthy of examination). That style of engaging arguments (“X said Y and it’s very wrong”) can sometimes appear more personal than it is (especially for the person whose idea is being criticized), but it almost never is about the person; identifying a specific expression of an idea is, in my view, the only way to criticize the idea honestly and rigorously. If I were to argue that you shouldn’t believe what the Dalai Lama has to say on meditation because he holds wacky evidence-free ideas such as reincarnation, I’d be engaging in a fallacious ad hominem attack. But if I’m criticizing the Dalai Lama for holding wacky evidence-free ideas such as reincarnation, it’s not inappropriate to notice his superstitions. Too often bigots, fools, and crybabies propel this flashy weapon to protect themselves from criticism by distracting the audience. Even if your attacker taunts you, standing above your argument’s vulnerable body, you must rebut the substance of his valid criticisms to prevent a negative pollice verso. Not Alone Anymore 3 Cheers!